The competence of the state in the field of sport has been specified by the Law on State Administration Organs and it is being carried out through the Ministry of Education and Physical Culture, where there is a Sports Sector. Pursuant to the Law on Sport, the sportsmen can associate in sports clubs, while the sports clubs of the same types of sport can associate themselves in sports association. The sports associations can commence their activity after the Ministry defines that all requirements have been met, for which it issues a decision. The discontented association can lodge a complaint against such a decision with the competent Commission within the Government of the Republic of Macedonia. The sports associations prescribe and implement the system of competitions at the national level as a part of their autonomous rights, which also comprise the method for selecting national teams. The Faculty of Physical Culture, a specialized scientific and educational institution, which is a member of the St. Cyril and Methodius University of Skopje, acts within the national educational system under the competence of the Ministry of Education and Physical Culture. Furthermore, the Secondary School of Physical Culture acts at the secondary educational level. 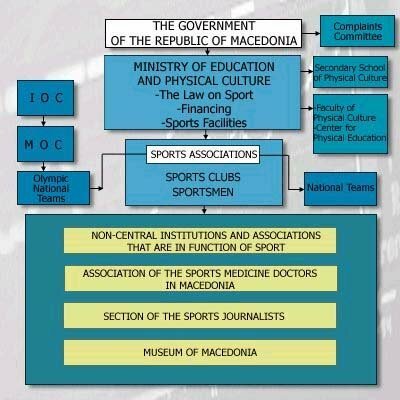 The Association of the Sports Medicine Doctors, the Section of the Sports Journalists and the Museum of Macedonia are complementary institutions and associations that are instrumental in the development of sport. In addition to the state administration organs, the Macedonian Olympic Committee (MOC) is extremely valuable for the overall sports life in the Republic of Macedonia. It unites the sports associations to carry out Olympic programs. Although it functions according its Olympic principles, the MOC has been obliged to harmonize some of its acts with the national Law on Sport for the purpose of underlining its national feature and compatibility with the national sports system.